I have been considering names as a powerful tool, lately. Names and stories, narratives, as grounding and foundational. Since hearing these questions in a podcast, I have deeply resonated with these prompts as a guiding frame. Despite my dislike for naming things, a name becomes a jumping off point, a guide. It becomes context and a beginning for understanding. Odette Press is a new chapter of making, a distinction in the practice, and I’ve considered these questions about naming, community, and gift in this new chapter of creative life. Where does Odette Press come from? My family, my matriarch, my center. Odette Laughlin is my father’s mother. Odette is my tie to mountains, to travel. Odette is a fierce Capricorn woman, born in the winter of ’31, who, after meeting my grandfather, had a wedding in Damascus and moved from Beirut, Lebanon, to the states. I wanted to travel, she tells me. I wanted to see the world, she says. Odette is French, meaning wealth, its origins an acknowledgement of postwar French rule in Lebanon. Odette is at my center, my middle name. Pictures from my grandfather, of Odette. Odette Press, for me, started as a need to distance between my artist / maker self, between objects and practice. Odette Press started as a note written on a scrap of paper the winter I lived alone, rediscovered while cleaning in the spring. Odette Press is a place for stories, a place to contain. A place for narratives: writing letters, writing lists, writing to friends, writing to self to remember. Remember. There are many things we don’t remember. Family details that I would love to find. Exact names, places, locations, of people and family members as they left home and returned. What Odette’s mother told her about being Armenian, besides the horrors of genocide, and that it was often too hard to talk about or comprehend. I think often about the vast unknowns of a story and acknowledge the abundance of knowns, how journals and letters and writing bridge the gaps between present and past. How these handwritten accounts connect us to the women of my history - their turmoils, their existences, their triumphs. How writing weaves together narratives that bring me to the woman I am today, traveling and returning, writing and reflecting. Journals and writing and letters find their importance in both a present and a past sense. I write in my journal as a way of placing myself and my narrative, of coming home to a space: here, the shadow of light on a tree, and yesterday an insight I’d like to remember. A list of the thing I love in a day. I return to my journals as spaces to see, as spaces to say, oh yes, perhaps I have grown, perhaps I do still have a great deal of work to do. Tools for my own mapping, my own reflection. I do not have journals from Odette, but I am grateful for the time I spend with her. I make notes in journals of my conversations with her, an act of gathering and remembering. In considering the act of writing as an act of remembering, I widen my perspective to consider all those whose voices have not been recorded, have not remained. How the act of writing and remembering is not something we’ve all always been afforded. How the presence of a written experience in a diary can unlock vast multitudes of knowledge about a person and their experiences. In considering the personal narratives that remain unknown, I consider the hundreds of thousands of narratives we lose when the power of recording, reflecting, connecting is not present. So this is both a call to go inside and connect to self, and a call to connect outwardly and expand. Write your stories, go inside, exhale. Remember and reflect on your experience. Take the time and space for the inner work and then, like the breath, expand. Fill your lungs with breath and your ears, let them listen to the stories of others. Build from the framework of your own experience to connect to everyone around you. Expand your circles, your lungs, and your capacities for understanding. To take the time to connect. Odette Press is an invitation and Odette Press is a homage. To travel, to going, to expansion. To courage, to writing, to remembering. To my own leaving, exploring, and returning. To the mountains, landscapes, and vistas that continue to teach me. To the woman who taught me to sew and hold things carefully in my hands, who reminded me that with time and careful pressure any piece of aluminum foil can be made creaseless again, who taught me the necessity of a well-timed stern look and furrowed brow. Who met me with a carefully placed furrowed brow when I told her I was leaving for California, and encouraged me to both explore and be safe. Odette Press is both a brand, a separation, and an act of love and togetherness. It is me at my center and throughout generations, my past. I am glad to share the products of this journey with you today. Do you write in a journal? Do you send letters? Have you learned more about a person because of a journal? Share your experiences below! healing, like many processes, is a multifaceted and non-linear experience, one that requires equally multifaceted systems of support. there is the support of speaking and of being held in both silence and conversation together with friends, families, and communities; the support through body movement, exercise, the grounding and connecting to our physical selves; and the deep healing self work of sitting with your thoughts, processing through writing, drawing, and journaling. it is precisely the potential to heal and grow through the act of writing and visual creation that drives me to do the work of making books and marbled papers and share these practices with the world, to do the work of being an artist. a project as of late that has converged my love of the landscape, contemplative practices, and building community is the opportunity to create a series of custom notebooks with marbled papers based on a specific landscape for a friend. the specially crafted, handmade journals were made for participants in a women’s combat veteran’s support group, created with the specific intention to provide space for these women in their process of healing. in june my friend michelle approached me about creating a series of custom journals based on the colors and shapes of the landscape near spirit rock meditation center in woodacre, california, where we met while on a silent meditation retreat. michelle is an avid practitioner of buddhist meditation, a physical therapist, a veteran, and all-around incredible woman, who is part of a support group for other women combat veterans. drawing from the trauma of active duty service, michelle utilizes meditation, mindfulness practices, and journaling in order to build a framework for a life of healing and is the embodiment of post-traumatic growth. michelle’s dedication to her practice and her amazing perspective on life are such an inspiration and it is an honor to be able to create work for her in this way. per michelle’s request, i created a set of twelve, hand marbled notebooks with patterns and colors based on the landscape surrounding spirit rock, where we attended our meditation retreat. spirit rock, for me, is a place of my own awakening, my own opening up: the bright, clear, blue skies held space for my breath and my own processing; the golden, sun worn hillsides sloped in what seemed to be forever across the sky, dotted with dark green shrubs and plants. mixing colors to reflect each aspect of the landscape, I created sloping, mountainous shapes underneath swirling blues for the sky. each notebook reflects similar patterns and shapes, though no two designs are alike. I started the notebooks in baltimore, and finished them using my guillotine paper cutter in the middle of the street near oceanside, california. that next day I drove to an area outside of long beach where I met with michelle in a cafe to hand deliver her journals. In this way, the act of delivery became a ritual in itself, coming full circle from attending the retreat, back to baltimore, all the way back to california. as we met and talked, we delved into both why the journals were created - to highlight the beauty of the landscape of northern california, to provide space for healing - and also discussed at large the tremendous benefits of the process of writing in general. in delivering these journals to michelle, I saw how the process of creating these journals was simply the planting of a seed, and that the richness of the experience doesn’t just stop when the journals are delivered. the pages of the books are enriched with each page that’s filled, each goal it retains, each dream it holds. in the cafe, we discussed so many rich and incredible topics - why journaling, how we journal, what role trauma or turmoil has had in rooting us soundly in our foundations today and how our experiences give us a unique and compassionate perspective of the world around us. We talked about how the physical act of writing is more beneficial and successful for the purposes of processing than writing digitally, and how meditation and breathwork can support us in the work we do. before we left, michelle left me with a beautiful quote which i love for its connection to the process of embarking on a path of awakening. she said she’d heard it elsewhere and couldn’t remember the source, but that it went something like, “an egg, when broken from the outside, reflects death. but an egg that cracks from the inside out means life.” when we open ourselves up to our own lives, when we put trust in ourselves and the world around us, we give ourselves the space, the tools, and the time, to do our own cracking open, our own awakening, life gives us what we need. in sum, this process of making an affirmation of the path: I make books and journals because they are safe spaces, because they provide us with avenues for grounding, growing, and exploring our deepest and most authentic selves. michelle, it is an honor and a privilege to be able to make for you from our shared experience at spirit rock. thank you! interested in working together to create journals to tell your own story? send me an email! for artists, teachers, and folks working in healthcare, visit hemera.org to apply for funding to attend a meditation retreat. i am grateful to the hemera foundation for their support in my journey of meditation. i spend a lot of time thinking about both book structure and purpose: to me, a book is a container, a book is a space for healing, a book is a space for stories. a book is a place for the reflection of rituals and sacred exchanges, our big and small moments of awe and intrigue. the act of creativity, of creating a custom book, for me, is furthering of a kind of magic: we take an idea, a conversation, a vision and we make it into something tangible. we listen, we contemplate, and we make. in early 2017, brittni approached me about creating a custom guestbook for her wedding. 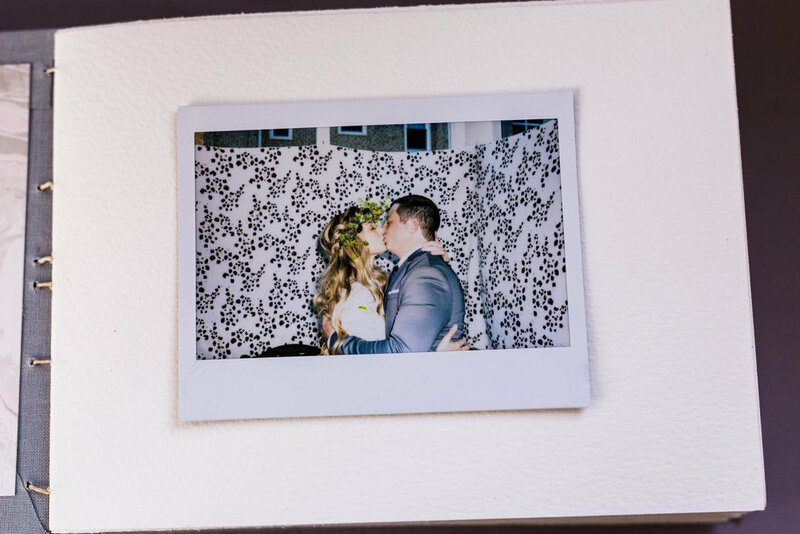 she wanted an object that would serve as a space for remembering the magic of her special day, for holding polaroids and notes of care and encouragement from family and friends. knowing brittni's work as a dancer and a yoga instructor, i knew wanted to create a pattern that is as fluid and free as a dance, and combine it with the structure and support of a strong binding, evoking both the structure and support of a partnership, a marriage. together we chose a coptic stitch, leaving the knots of the binding exposed; a cool, gray cover with the bride and groom's names hand lettered and adhered in a recessed space; and end pages with hand marbled papers in grays, blues, and pinks. but for johnny and brittni, we expanded the joy of their wedding day even further: in addition to recreating johnny and brittni's coptic bound photo album as a christmas gift for her family, we also worked together to create a set of unique photo albums for wedding for other members of her family. brittni printed images of the wedding day and pasted them into the books to share with family and friends. thanks so much, brittni! for your own custom book, send me an email.